This simple Sweet Corn Soup has been a family favorite recipe at our house for years! My used to make it growing up and it’s one of the recipes she wrote down for me in a little green recipe notebook when I left for college. 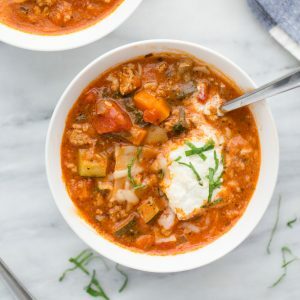 I made this soup for my roommates a few times in college and they all still love it too! 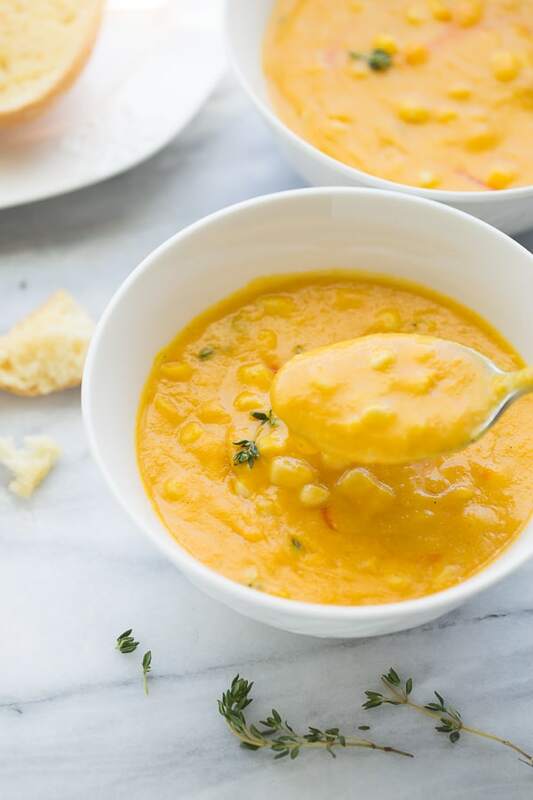 This sweet corn soup is made with simple ingredients and makes a delicious dinner with some gluten-free garlic bread. I like toasting up Schar ciabatta rolls with a spread of garlic butter to serve with this soup. In the fall my kids love butternut squash soup (we like this recipe) and in the summer this is our favorite soup! It can be made with fresh corn but I actually prefer it with organic frozen white corn. It’s so much easier and just as tasty! 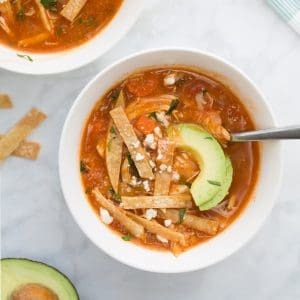 This soup tastes great with a pad of butter, hot sauce and a squeeze of lime. I hope you like it as much as we do! Heat a medium/large pot over medium heat. Add the olive oil along with the potato, carrot and onion. Cook until the onion is tender, about 6-7 minutes. Add the garlic and cook for 30 seconds. Pour the in the chicken stock and stir. Add salt and pepper - about 1/4 to 1/2 teaspoon each depending on saltiness of your stock. Bring to a boil then cover and reduce to a simmer for 5 minutes. Add 3 cups of the corn and cook, covered, for 10-15 minutes until vegetables are tender. Transfer the mixture to a blender and blend until smooth. Alternatively you can use an immersion blender to blend until smooth. Pour the soup back into the pot. Add the remaining 3 cups corn, parsley and salt and pepper to taste. Serve with a squeeze of lime and butter/hot sauce. Enjoy! 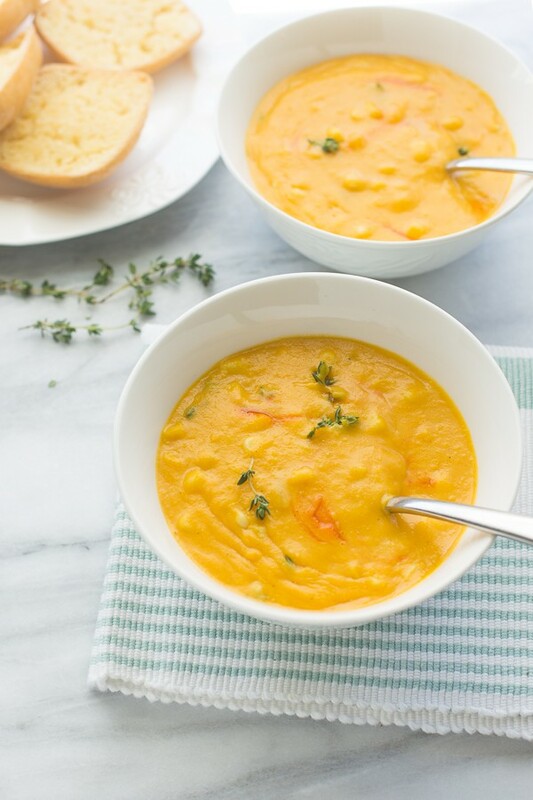 This Creamy Corn Soup from Vegetarian Mama also looks delicious! Great recipe! I made it last night. Super simple perfect matching of flavors to really enhance the corn. Thanks for this.